Are you new to Springfield or looking for a new dental office home? 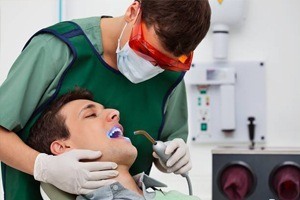 Before you settle on the practice closest to your home or office, we recommend taking a few moments to review this page to learn what to look for when choosing a nearby Springfield dentist to address your unique oral health care needs. Our Springfield dental office provides a wide range of benefits, and we hope you’ll consider Advanced Dental Care to provide all of your necessary dentistry services. If you want to learn more about our Springfield dentist and dental team, call our office to schedule a consultation today. We look forward to seeing you soon. The number one reason patients choose to visit Advanced Dental Care for all of their dentistry needs has nothing to do with the services we provide. Instead, it’s our highly trained, caring, professional dentistry team. We have three skilled dentists on the staff to provide a wide array of preventive, restorative, and cosmetic dentistry services as well as more advanced treatment options. Most importantly, they each take the time to get to know their patients and create personalized treatment plans to keep their smiles whole and healthy. From the moment you arrive in our office, you’ll be treated with kindness and respect. Our team members will welcome you to the practice and help to ensure you feel right at home throughout your time with us. Our caring team would love the opportunity to tell you all about the skilled, gentle dentistry services we provide for each patient, but you don’t have to take our word for it. Instead, we invite you to read reviews and watch video testimonials from our happy patients to learn just what you can expect from a visit with the caring dentists and dentistry team members at Advanced Dental Care of Springfield. These online reviews and testimonials are often the best way for new patients to get to know us before their first appointment. We know that our Springfield families want to receive quality dental care at a price they can afford, and we do our utmost to keep the costs of dentistry services reasonable. To offset out of pocket dental care cost, we are happy to process and file dental insurance claims to maximize your benefits for covered services. We also work with CareCredit to provide low and no interest financing plans to breakdown the price of treatment into several small chunks. Don’t hesitate to talk to our team about insurance and financing options available to you.